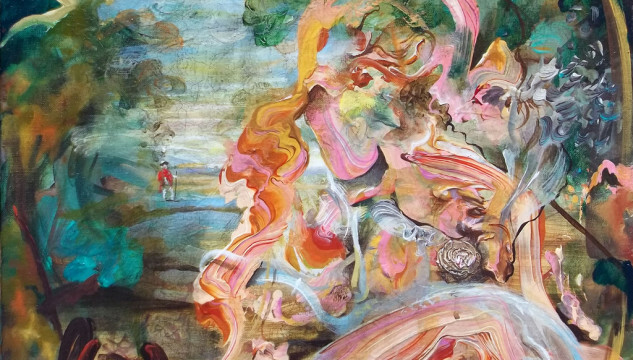 Castlefield Gallery is delighted to present a solo exhibition by Iain Andrews. Andrews has gained significant recognition for his seductive and sensuous paintings, which combine art historical references with dedication to a visceral painterly language. He has exhibited internationally and has been shortlisted for prestigious prizes inc. the Jerwood Drawing Prize and the Marmite Painting Prize which he won in 2011. His work has attracted the critical attention of writers and curators resulting in a rich dialogue around his practice including a piece of creative writing by Joanne Reardon Lloyd. Andrews’ work mixes the colour palette of contemporary abstract painting with the dirty browns, cracking paint and varnished sheen associated with the Old Master and nostalgic Victorian painting, from which he also appropriates various compositional and figurative elements. He also works in dialog with folk tales and the themes of historical paintings. Though his works demonstrate knowledge and skill he does not over-identify with academic sophistication or current trends in contemporary art, rather he reveals a confident belief in his work that has no need of such validation. 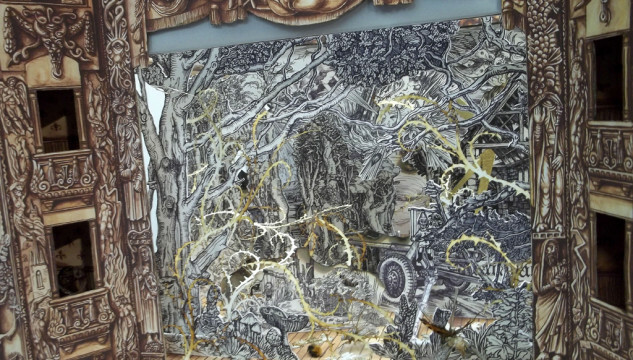 This Re-view exhibition will give Andrews the opportunity to show a selection of the paintings and drawings he is known for alongside recent sculptural pieces such as Il Teatro dei Leviatano (2013) a miniature theatre constructed with intricately illustrated props and backdrops and ambitious new works. At Castlefield Gallery he will apply his draftsmanship skills to a new site-specific work for the gallery’s double height space. This large-scale mural will form a dramatic backdrop, making overt the gallery’s function as both a platform for viewing and a stage on which a drama is played out, positioning the viewer as a protagonist in art history’s ongoing dialogue. His paintings reflect a 20th century shift in our attitude towards history; rather than depicting a moment in a linear chain of events they mark points in a skein of relations. Many of the historical paintings Andrews appropriates depict moments within a narrative, a frozen point in a drama, which provide the viewer with a space for stillness and quiet contemplation. 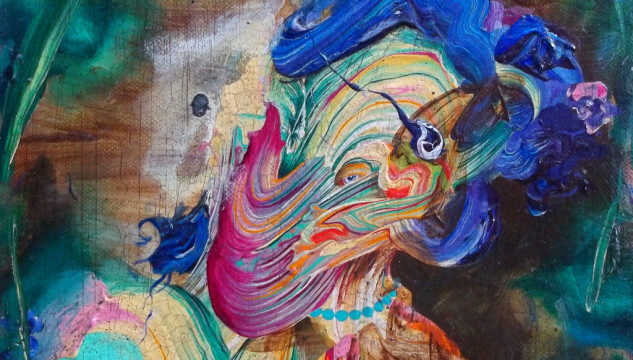 Andrews’ takes figurative references and mixes them with complete abstraction. Presenting a sense of narrative progression in the form of the paintings themselves, they depict the noise of history, churning and oozing under the weight of disparate story lines without beginning or end. This sense of eternal movement, of constant recontextualisation with the viewer firmly positioned as a part of it, provides an alternative space for contemplation. 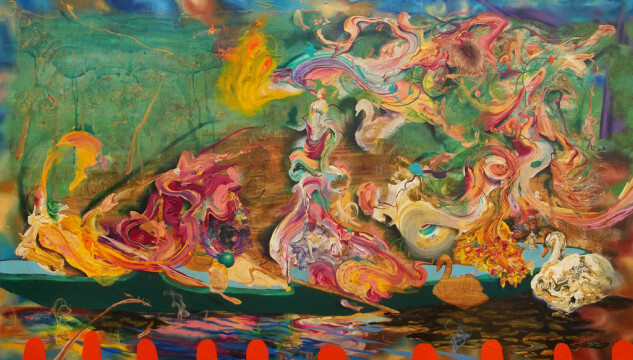 Andrews’ works thrive in a time when an increasing awareness that the meaning of all things is always already changing shares the same space as candid belief in consistent truths. Iain Andrews (b. 1974) Lives and works in Manchester, UK. He is represented by Man&Eve, an art gallery and curatorial agency based in London manandeve.co.uk and works as an artist in residence and Art Psychotherapist at Trinity High School in Manchester. He has had solo exhibitions at Man&Eve, London (2013) and Warrington Museum and Art Gallery (2012) and has featured in numerous group exhibitions throughout the UK, USA and Europe. He has been shortlisted for several prestigious prizes inc. the Jerwood Drawing Prize and the Marmite Painting Prize which he won in 2011. 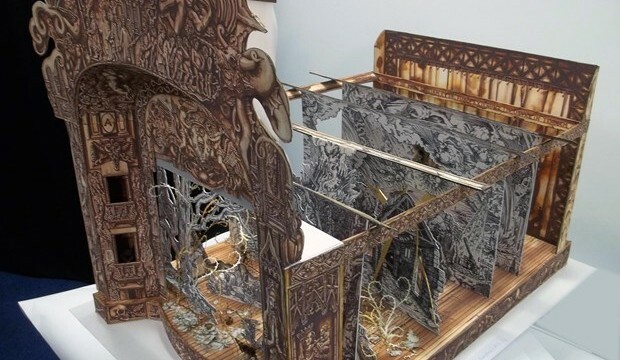 Il Teatro dei Leviatano (2013), a miniature theatre Andrews constructed with intricately illustrated props and backdrop,s produced for his solo exhibition at Man and Eve Gallery, London, marked a shift in the content of his work and an interest in the idea of ‘Il Teatro’ (The Theater) as a site of narrative progression. At Castlefield Gallery Andrews will apply his draftsmanship skills to a new large scale site-specific mural that will form a dramatic backdrop, making overt the gallery’s function as both a platform for viewing and a stage on which a drama is played out, positioning the viewer as a protagonist in art history’s ongoing dialogue. Andrews has often drawn attention to the viewer’s place in front of his paintings by manipulating depth, scale and surface. 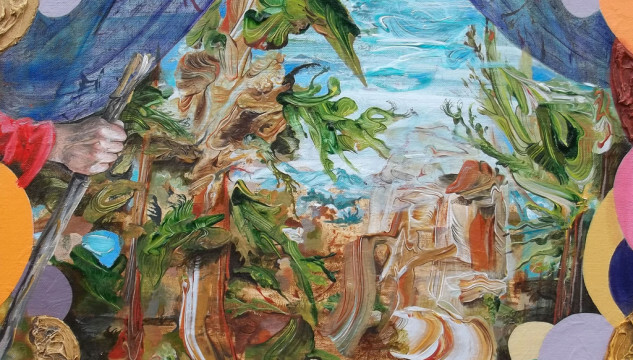 Gestural blobs of impasto paint sitting on the surface of the canvas are given shadows within the picture plane, whilst enlarged and shrunken figurative elements are arranged over deep and detailed undergrowth. Dr Joanne Reardon Lloyd is a creative writing tutor with the Open University. Joanne writes radio plays and has worked at the BBC producing short stories for the series Opening Lines. She was commissioned to write a short story, My Mind’s Eye as part of the Iain Andrews debut solo exhibition Mythopoeia Warrington Museum and Art Gallery in 2012.